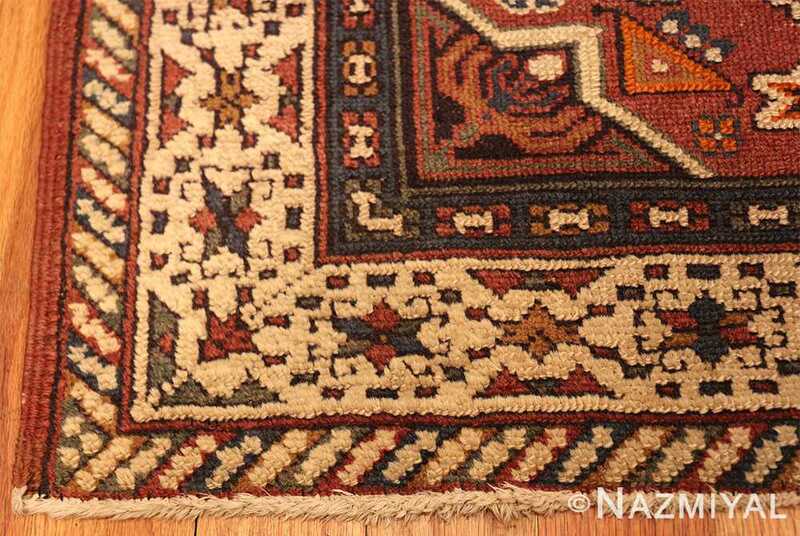 Delicate small antique Bezalel rug from Israel, Country of Origin / Rug Type: Israeli Rugs, Circa date: 1900 – This small antique Israeli Bezalel rug is a treasure that was woven around the turn of the 20th century. 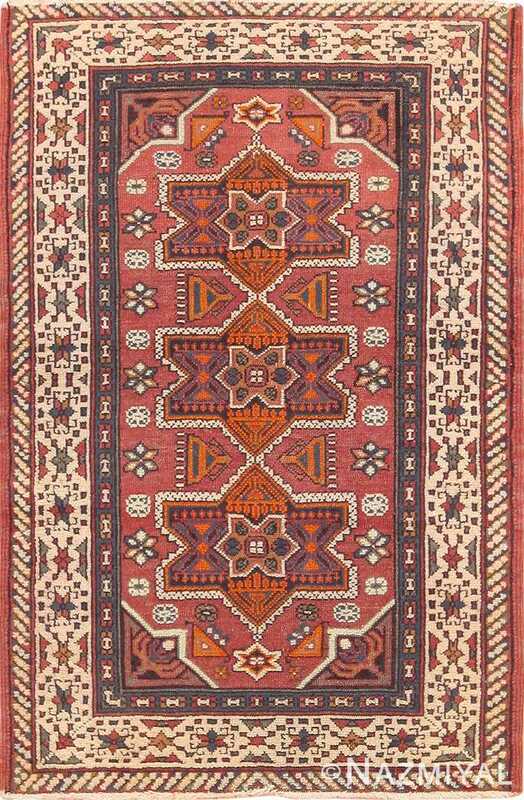 This beautiful antique Israeli rug features an artistic arrangement of mauve, browns, blues and fiery oranges in motifs that are uniquely reflective of the roots of the Judaica rug. 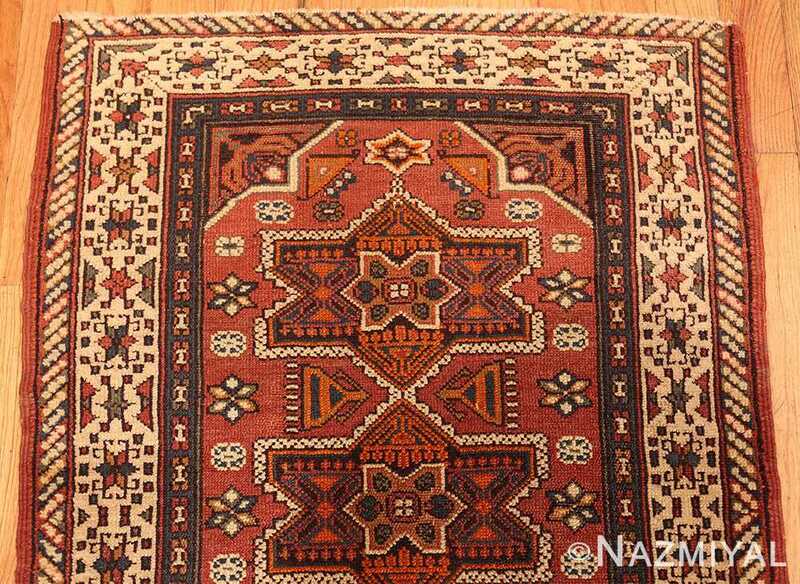 The antique rug features six pointed Star of David designs, as well as the menorah motif throughout its field and borders. 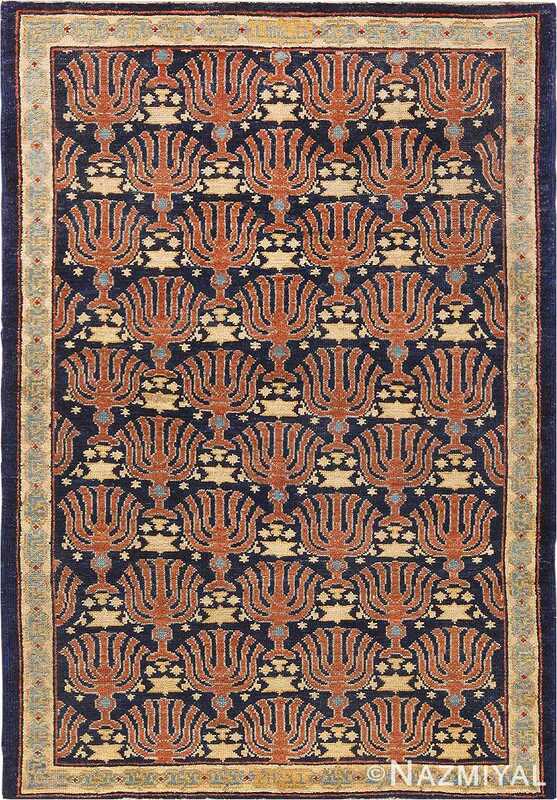 The use of a soft purple mauve colored field design and ivory in the borders highlights the central design motifs and makes them stand out. 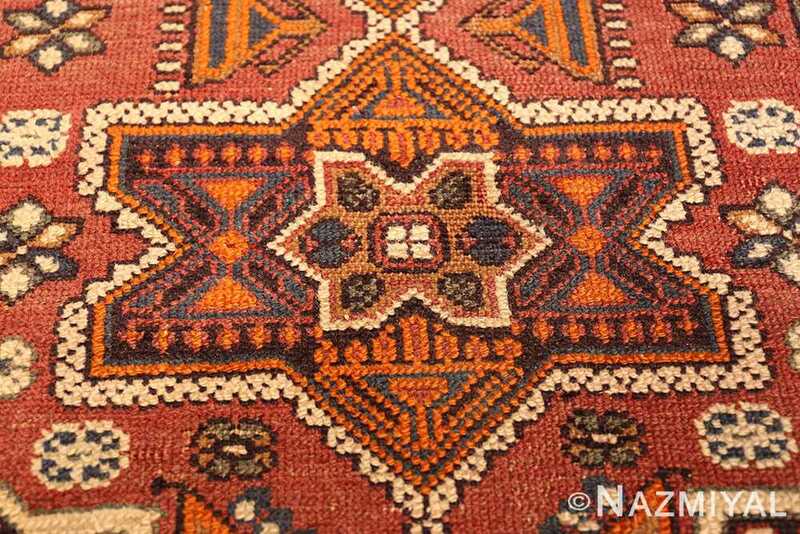 Perhaps the most significant feature of this small antique geometric Israeli Bezalel rug is its use of geometry to provide a sense of order and create formal symmetry. 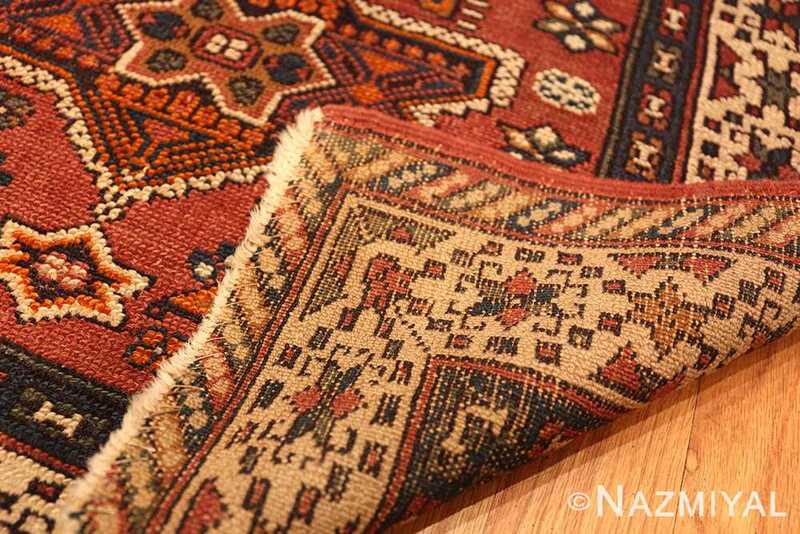 This is highlighted by the change in the direction of the slant in the outermost border. 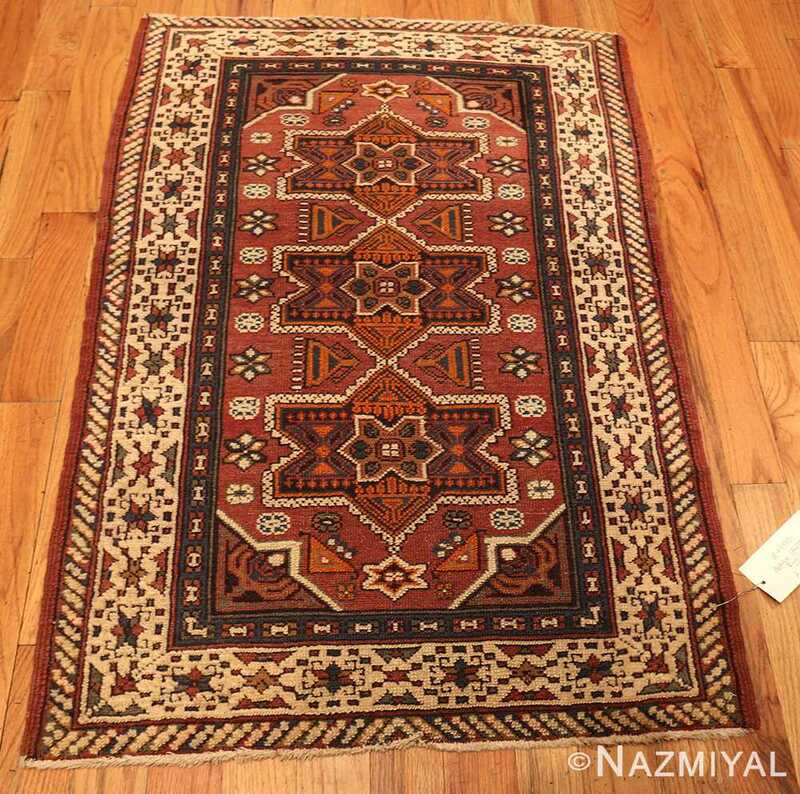 This artistic antique small size rug is symmetrical, both vertically and horizontally with lit menorahs in the formal corners of the design. 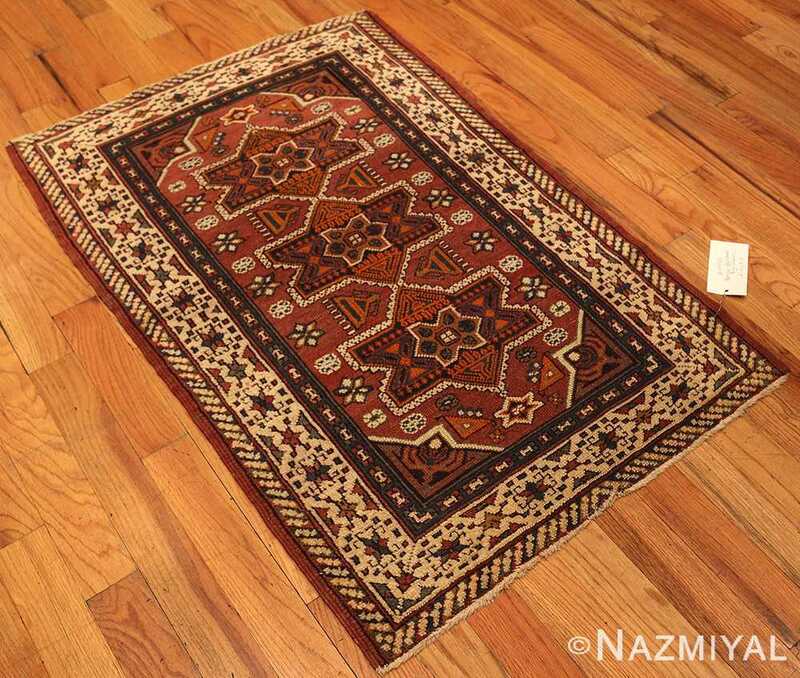 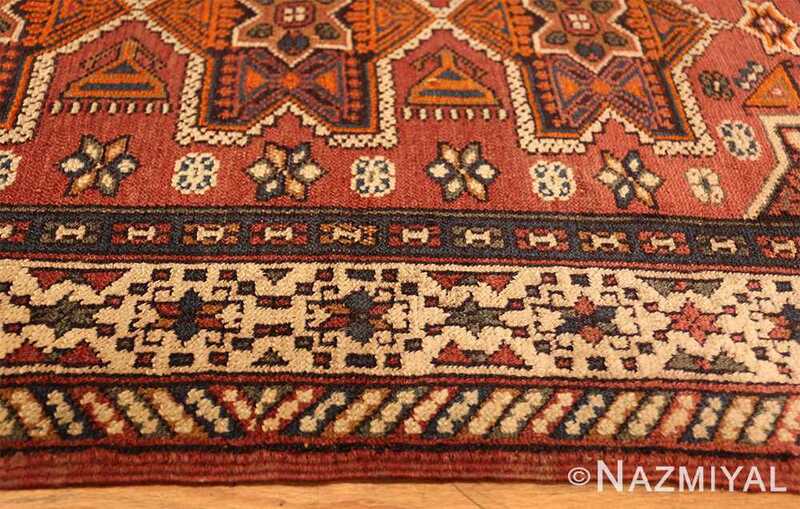 The central design of the antique rug is guarded on both ends by the Star of David. 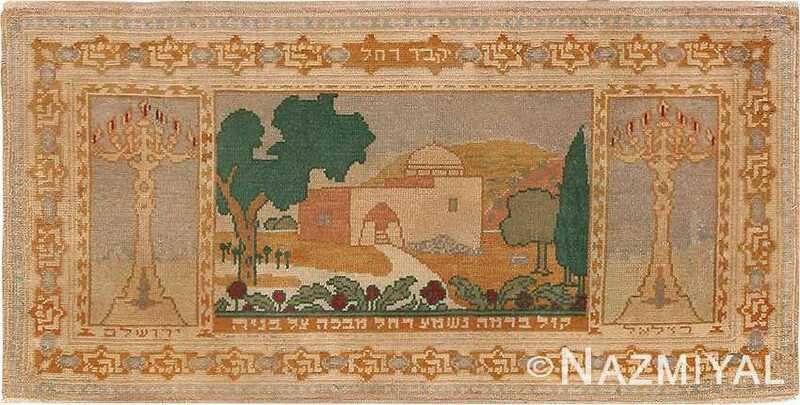 This Israeli Bezalel rug beautifully combines symbolism with a traditional design. 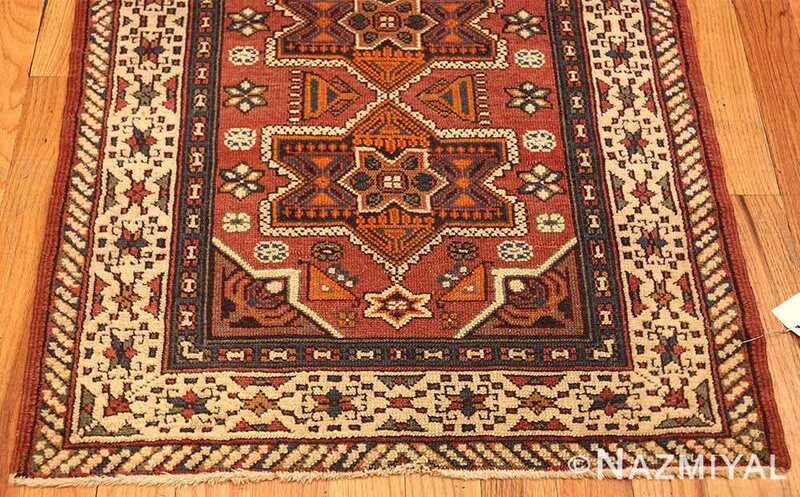 The simplicity of the design gives it a tribal feel, yet it is carried out with a precision that brings out its formal qualities as well. 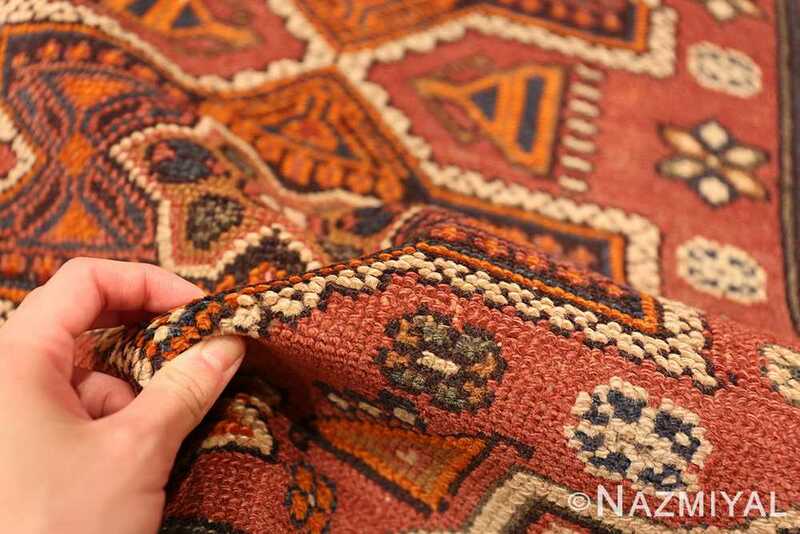 The beauty of this antique Israeli Bezalel rug is not only in the artistry of it is design, but in its use of Judaic design symbols that represent the history of the Jewish people. 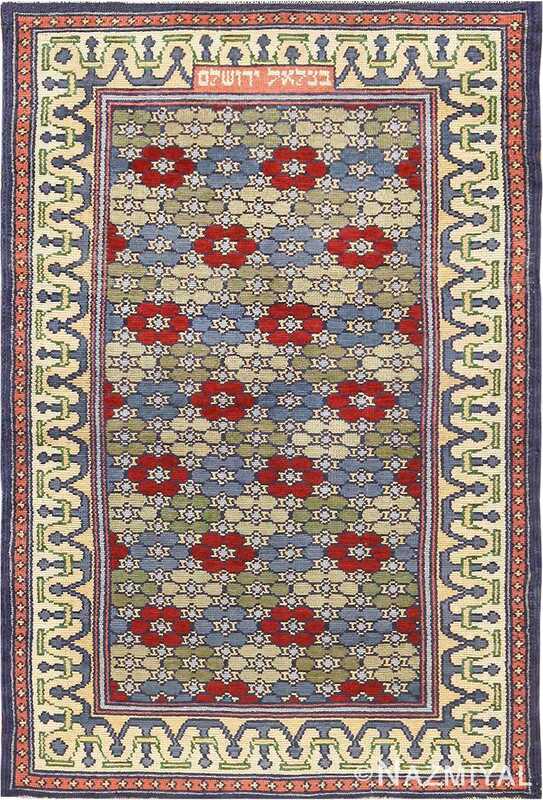 The Bezalel rug from Israel is small enough to be used as an accent piece or to serve a special place in the holiday traditions. 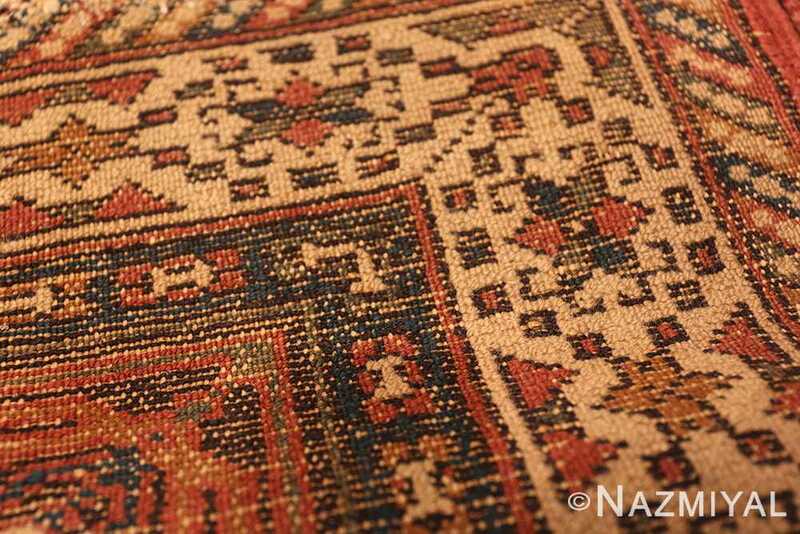 Regardless of where you decide to place it, it is a piece to be treasured and handed down to future generations to enjoy and cherish.